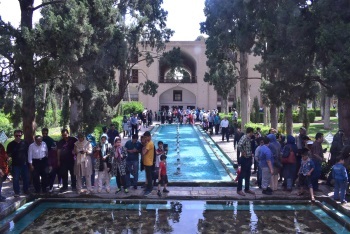 Bagh-e Chehel Sotun in Isfahan. "The Persian Garden" comprises nine gardens from different epochs and climates. They derive from the Chahar Bagh model: the division of a site into 4 sectors, opening out into the 4 cardinal directions. The tradition and style in the garden design of Persian gardens has influenced the design of gardens from Andalusia to India and beyond. The design is dominated by geometry and the use of water as a central element. This dates back to the 6th Century BC. During our Iran visit in May 2017, we ticked off three: Fin garden in Kashan, the ancient garden in Pasargadae, and Eram garden in Shiraz. We also had a fair glimpse of Chehel Sotun garden in Esfahan from its gates. However, after having seen India's Persian gardens earlier in 2015, which were adopted by the Moghuls using no less than Persian artisans, how should we appreciate the Persian gardens from the country where the tradition originated? We visited Bag-e Fin on a Friday, which was not the best day to be a tourist in Iran since it is their weekend. Expecting tranquility and peace in the oldest functioning Persian garden in the world, what welcomed us was a garden fully packed with locals picnicking and groups occupying every known space inside. Sadly, knowing that we enjoy taking photos, the experience did not turn out the way we expected it to be. If there is any consolation, however, there was water flowing, all the fountains were working, the pools were not empty, and the water source, the Solomon's spring (a qanat opening that also feeds water to the T-Listed Tepe Sialk), can be publicly seen at the back. There were other attractions inside (ridiculously with separate entry fees! ), but we no longer bothered giving them a try due to the long queues. Another thing that impressed me was that the garden is surrounded by thick and high mud walls typical in the desert region. The 500BC-built ancient garden of Pasargadae is in ruins. Only the remains of the stone layout, watercourses, and fountain pools are left. One can only then re-imagine how the garden might have looked like during its heyday out of these relics -- a leisurely activity that my partner found difficult to enjoy. The garden was the realization of Cyrus the Great's desire to recreate paradise on earth. The river that cuts through the capital used to supply the water needed for the garden via canals. We, however, did not see any tourists who paid any attention or interest in the ruins of the garden. This is despite the fact that the garden is an interesting case: while the garden is a UNESCO World Heritage Site (WHS) in its own right, it is located inside another WHS, Pasargadae (as a testimony to the first capital of the Persian empire). The inscription of the Pasargadae garden is a nod to the provenance of the Persian garden tradition. The presence of a signage explaining this, as well as visual re-creations of the garden, might prove beneficial to visitors. 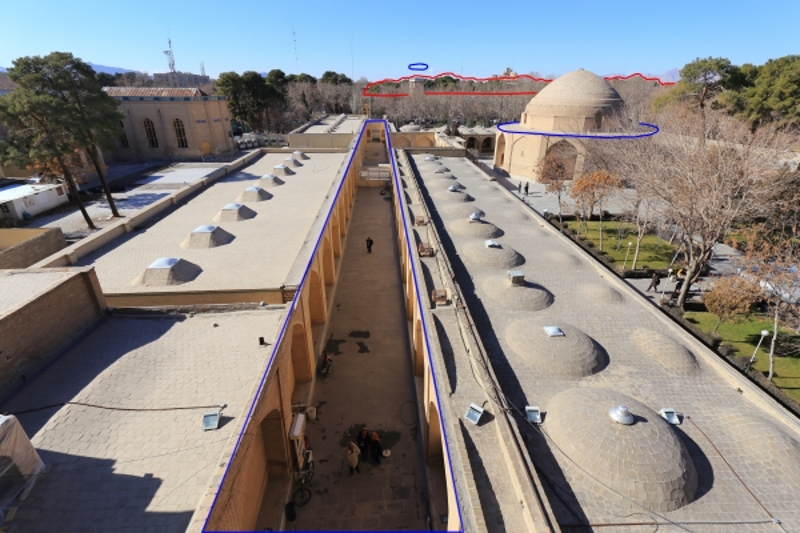 Bag-e Eram, which is now managed by a local university, is bigger than the one in Kashan, allowing more spaces for roaming around. The Qavam pavilion, which serves as the backdrop of the garden, is a pleasant work of art and architecture from the Qajar period. What we enjoyed the most there was an abundance of many local plants and trees, some were even in bloom during our visit. The only sad thing about Eram was that the water courses and fountains were dry, something that has been reported to be the case for quite some time now. A friend we traveled with from Yazd to Shiraz just had to compare it with the Bag-e Shahzadeh in Mahan, which has an abundant water supply despite being in the Lut desert region. Nevertheless, Bag-e Eram was the redemption we needed to truly experience a Persian garden eventually. Assessment: while there are more to appreciate in the Persian gardens in India (the Taj Mahal and Humayun's Tomb, for example), the pleasure derived in visiting the Persian gardens in Iran lies in the fact that they represent the pure form of this gardening tradition that reflects Persian philosophy and ingenuity, mainly in their mastery in the use of water for the gardens' survival and aesthetics. 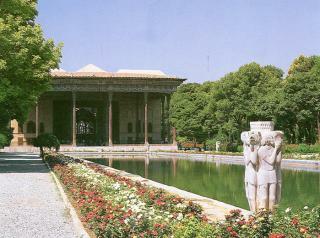 Overall, the Persian gardens are humble, modest and unpretentious gardens. I, however, cannot imagine having the need to visit more than what we have seen -- 3 was more than enough to get a proper feel of what this UNESCO WHS has to offer. Another one is in Pasargadae (a UNESCO site inside a UNESCO site). Since Pasargadae is an archaeological site, there is little left over from the garden. The only thing left from the garden is the outline of the watering canals. The Bagh-e Shahzadeh (picture) in Mahan has a really nice long split-level fountain (fortunately there was water flowing, although I heard that a few weeks before my visit it was completely dry). Only half of the Bagh-e Dolat Abad in the desert city of Yazd is open to the public, but it's still nice to visit, mostly because of the pavilion with the stain glass windows and the largest wind tower of the city (when you stand underneath it you can really feel the wind). 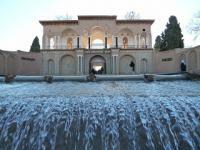 The Bagh-e Chehel Sotun in Esfahan has the palace I liked the most. It has amazing frescoes on the inside and the outside. The last one I visited was the Bagh-e Tarikhi-ye Fin in Kashan. It has a really nice small pavilion, a bath house and the small museum hosts some really nice pieces. It was also one of the few gardens that had water running through it in winter. Even though winter is not the best time to visit the gardens, I still enjoyed visiting them. On Fridays lots of families will visit the gardens and on other days you are likely to bump into young couples who will offer you tea.